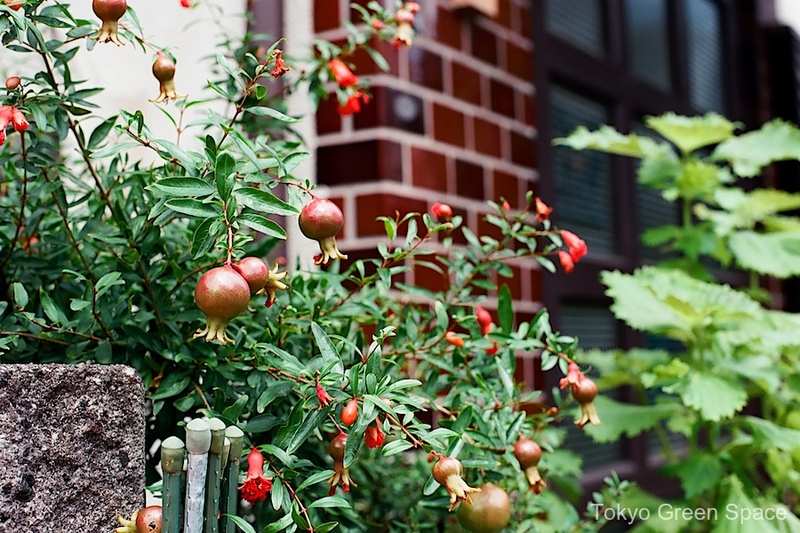 I don’t know if you can eat these mini-pomegranates but they are really stunning. This is just on the other side of the wall from the yellow sunflower image I posted yesterday. 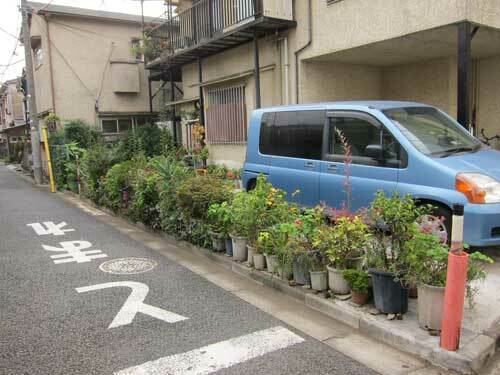 I love how this gardener maximizes space by extending out into the public realm. The road-side part of her garden also gets more sunshine. This is the view from my apartment building lobby on a rainy spring day. Because of energy conservation, many lights are turned off. This increases the contrast between indoors and outdoors. I walk through this lobby every day, and rarely think about it or consider taking a photo. Recently, I participated in the Xerox and City photo workshop at Vacant, led by Hirano Taro and organzized by Too Much magazine as part of their Romantic Geographies series. We were asked to take photos of our breakfast and then our trip to the workshop in Harajuku. It made me think more about spaces that become automatic or ignored. Tokyo residents are more aware of energy use and lighting now. Many parts of the city are less brighly lit: from billboards to train stations to residences. By lowering our lighting, we are more attuned to natural cycles, and more sensitive to the boundaries between private and public, indoor and outdoor, personal and shared resources. 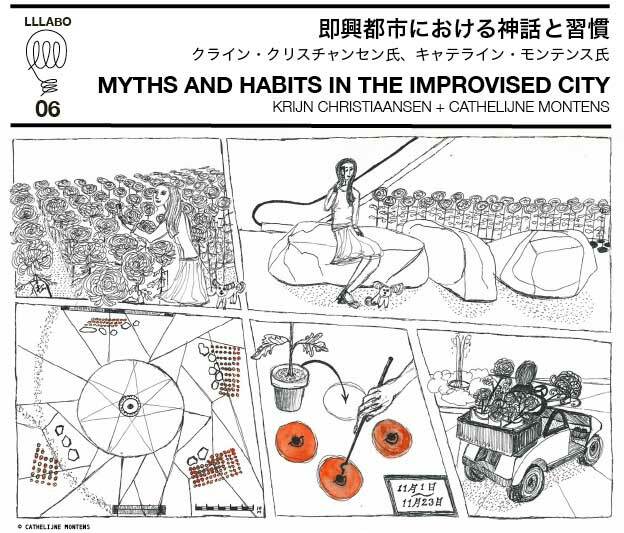 Please have a look at my recent TEDxSeeds presentation about making Japan a world leader in living cities. This TEDxSeeds presentation, with English and Japanese captions, looks at how Japan can become a world leader in living cities. 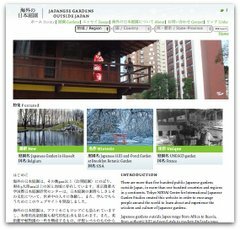 Despite Tokyo being the world’s largest city with a history of poor design, there are many opportunities for creating plant life and wildlife habitat. My goal for next year is to work with city governments, corporations, community groups, railway companies, and others to plan and implement creative public spaces that connect urban life with nature. 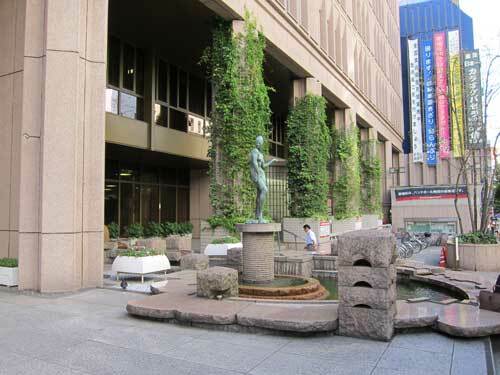 Metropolis magazine published my essay, “The Butterfly in the Metro,” that presents my impressions about the difference between public space in Japan and the United States. What is the role of shared spaces in urban life? What makes a city desirable? After living in Tokyo for just two years, I realize that what passes as normal in a large US city now seems peculiar, unnecessary and even unpleasant. Please read the full article on the Metropolis website. I am grateful to Eparama Tuibenau for the lovely illustration above. I love this fall perennial border despite the lack of ground soil and space. Fifteen to twenty pots contain flowering ornamentals on the narrow curb between an Asagaya residence and the small street. The garden is very complete and very public. I admire the gardener’s generosity to passing pedestrians and bicyclists.